This lease is for a small banking tenant who takes space adequate for a drive through banking operation on a shopping center pad. The form has a continuous operation clause, subject to holidays, regulatory closures and periods for construction of tenant improvements and repairs. THIS LEASE dated _____________ , between COMMERCIAL PROPERTY LANDLORD, hereinafter referred to as the Landlord, and ACCEPTABLE BANKING TENANT, a national banking association, hereinafter referred to as the Tenant, which is duly authorized to do business in _________________. Landlord demises unto Tenant, and Tenant leases from Landlord for the term and upon the terms and conditions set forth in this Lease, that certain portion of the building known as ______________ erected in "The Unique Shopping Market" in _______________, as shown on Exhibit A attached hereto, outlined in red on said plan, containing approximately _______ square feet of floor area, plus the _______ square feet drive- thru canopy, together with the right to the nonexclusive use, in common with others, of all such vehicle parking areas, driveways, footways, and other facilities designed for common use, as may be installed by Landlord, subject to the terms and conditions hereof and to reasonable rules and regulations for the use thereof, as provided from time to time by Landlord. Landlord hereby agrees to deliver possession of the demised premises to Tenant on __________ , or earlier if the demised premises shall have been surrendered to Landlord by ______ Bank prior to such date; provided that Tenant shall not be obligated to accept possession until the day after the date Tenant receives written notice from the Office of the Comptroller of the Currency that Tenant may establish a branch banking facility at the demised premises. 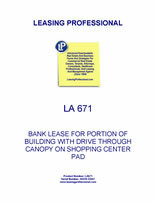 A Tenant shall use and occupy the demised premises solely as a branch banking facility of Tenant, and Tenant may conduct therein any traditional or non-traditional banking business that Tenant or any affiliate of Tenant now, or at any time during the term of this Lease, is authorized by applicable law to engage in. Any other use shall be negotiated between Landlord and Tenant, and approved by Landlord in writing. B Tenant shall continuously, during the full term of this Lease and every extension or renewal thereof, keep the entire demised premises occupied and open for business during the hours specified from time to time by separate memorandum mutually agreed to by Landlord and Tenant, except for reasonable periods of temporary closing for "Bank" Holidays or Tenant improvements and repairs, or when required to close by regulatory authorities. The term of this Lease shall commence on the date when the Landlord shall deliver possession of the demised premises to Tenant, as provided in article II hereof, and shall terminate one (1) year from the first day of the calendar month next succeeding the "Rental Commencement Date" as defined in Article V hereof. The parties hereto agree to execute, within thirty (30) days after the "Rental Commencement Date," a standard Memorandum to this Lease, marked as Supplement 1, fixing the definite date of beginning and end of the term of this Lease. Tenant shall have the option to renew this Lease for five (5) additional, successive one (1) year terms upon the same terms and conditions set forth in this Lease, upon the condition that the Tenant shall not then be in default under this Lease. To exercise a renewal option, Tenant shall give Landlord written notice of exercise ninety (90) days prior to the expiration of the then current term. Either party may terminate this Lease immediately upon written notice to the other party in the event that Tenant shall not have received by __________ written notice from the Office of the Comptroller of the Currency that Tenant may establish a branch banking facility at the demised premises. In addition, Tenant may terminate this Lease immediately upon written notice to Landlord at any time after __________ in the event Landlord shall have been obligated under Article II of this Lease, but shall not have by then delivered possession of the demised premises to Tenant.